Get the most pristine sound quality possible—and extensive monitoring and routing capabilities—in the most versatile audio interface available for Pro Tools | HDX, HD Native, and other pro audio applications. With Pro Tools | MTRX, you gain the superior sonic quality of DAD’s legendary AD/DA converters, plus flexible routing and monitor control when used standalone or with Avid Pro Mixing surfaces. And because the interface can be customized with the analog and digital I/O you need, you can take on the most demanding music and post-production challenges. Effortlessly. Avid's Pro Tools | MTRX offers existing and new Pro Tools HD users with Avid's HDX and HD Native hardware a pristine audio quality interface (up to 384 kHz DSD) and extensive routing and monitor control flexibility. Avid and Digital Audio Denmark have developed the MTRX interface to bring together an incredible option for a multitude of workflows within the Pro Tools HD family. 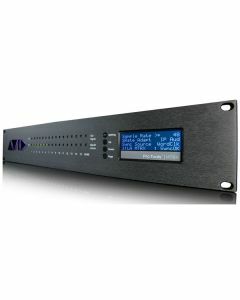 Connect and control your Avid or third party audio interfaces, expand your IO with up to 8 dedicated option cards in a range of options including Analog I/O, Mic Pre, MADI, Dante, AES3 and SDI, use MTRX as an integrated monitor section for Avid Control surfaces via EUCON and the included DADmon software, MTRX includes Pro | Mon 2 allowing you to control monitoring, talkback, summing and fold-down at the touch of a button. Digital Audio Denmark’s (DAD’s) AD and DA converters are renowned for delivering the cleanest, most transparent, and highly detailed sound. Pro Tools | MTRX is no exception, enabling you to get the best sound quality possible from your Pro Tools | HD system—up to super-high-resolution 384 kHz DSD. And because it does double duty as both an audio I/O and monitor interface, it offers exceptional versatility too. Take full remote control of all sources, monitors, and speaker sets directly from Pro Tools | S6, other EUCON-enabled control surfaces, and the included DADman software. Pro Tools | MTRX includes Pro | Mon 2, putting complete monitoring, talkback, summing, and fold-down control at your fingertips, whether you’re mixing in mono, stereo, 5.1, 7.1, 9.1, or even a 64-channel immersive audio mix. Pro Tools | MTRX is fully modular, so you can customize it with a wide variety of I/O and interface options. From analog inputs, outputs, and high-quality mic pres, to Dante, MADI, AES3, 3G-SDI, and more, you have the interface versatility you need to connect with any type of gear and route any signal between the various I/O formats. Using DADman software, you can route, split, and patch audio quickly, flexibly, and extensively, with a matrix capacity of up to 1,500 x 1,500 cross points. You can feed any input to any output, or even send audio to multiple outputs simultaneously, giving you unlimited workflow possibilities.